IDEA & ISAAC: Surely I'm Joking! 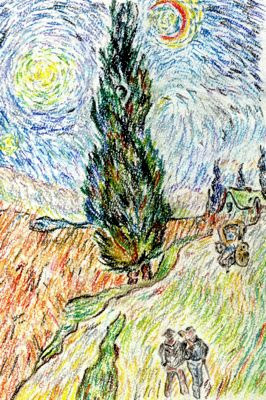 : "Van Gogh in Context"
"Road with Cypress and Star." On June 21 (Tue. ), 2005, I went to the National Museum of Art, Osaka, (NMAO) to look at the exhibition "Van Gogh in Context" together with my wife. The NMAO was opened in 1977 by the use of the Expo Museum of Fine Arts, which had been built for Expo '70. In 2004 the NMAO was relocated to the western section of Osaka's Nakanoshima district. This was our first visit to the new NMAO building. The building has a structure in the form of a completely underground facility and an exterior design "inspired by the life force of bamboo and the development and cultivation of contemporary art" . The present exhibition was realized with special cooperation from the Van Gogh Museum and the Kröller-Müller Museum, both located in Van Gogh's homeland of Holland. Just as written in the leaflet of the exhibition, we could trace the changes in Van Gogh's paintings from the dark hues of his early naturalistic paintings to the dazzling colors of his later works. Another feature of the exhibition was its attempt to provide cultural context for Van Gogh's artistic activities. For this purpose the works of artists such as Millet, Cézanne and Monet, whom Van Gogh knew and was influenced by, as well as Japanese ukiyo-e and books and magazines of Van Gogh's era were also shown (thus the exhibition is entitled "Van Gogh in Context"). I paid special attention to "Café Terrace at Night," because a friend of mine, M.Y., wrote me that he had chosen the best kind of copy of this work at the same exhibition held in Tokyo to buy it as a birthday gift to his wife. Only it was a pity that the museum was too much crowded. Web site, The National Museum of Art, Osaka.